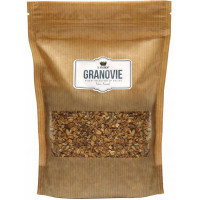 XAVIES 'GRANOVIE Coconut cinnamon. Would you like to pamper yourself extra? 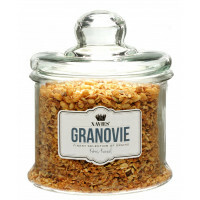 Then give your breakfast the taste of a delicious dessert with XAVIES 'GRANOVIE Coconut Cinnamon. This aromatic mix always gives you a heart-warming feeling. Combine with baked apples and your day can not go wrong! 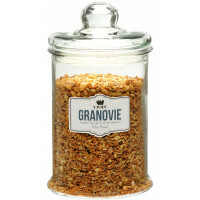 Ingredients: Oat flakes, agave syrup, coconut 10%, linseed, sunflower seeds, pumpkin seeds, sesame seed, semi-solid rice, quinoa, raw cane sugar, honey, cinnamon 0.2%. May contain traces of nuts. Nutritional value: per 100g: Energy 445 kcal, fats 15g (including saturated 5.3g), carbohydrates 60g (of which sugars 12.6g, of which fructose 11g), fibers 11g, proteins 13g. Absoluut mijn topfavoriet!! Lichte toets van kaneel waardoor die nooit verveelt; perfecte combinatie met kokosnoot. Heel lekker, echte aanrader!